Airlie Beach Day Sailing is a boutique owner/operated gourmet sailing tour for a maximum of eight guests - Adults Only. Children are welcome on private charter only with a maximum of 10 guests. Indulge in the peace and tranquillity of sailing the Whitsundays and soothe your palate with the delicious gourmet lunch and sweet treats throughout the day. A day tailored to suit guests and Mother Nature combined with low guest numbers make this a truly personal experience. Owner/skipper Dale's years of experience and passion for sailing is obvious and contagious. He is more than happy to let you take the helm or trim the sails! Or just relax and enjoy the views surrounding you in the heart of the World Heritage Great Barrier Reef. 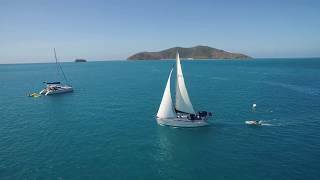 If you are looking for a real and authentic intimate experience in an idyllic location with great company and great food, then look no further than Airlie Beach Day Sailing. All food and light beverages included. Bring your own alcohol for the sail home. Great memories are guaranteed! The Full Day Gourmet Private Charter is an absolute must for those looking for a truly authentic personal experience with a passionate crew without all the crowds. Your gourmet palate will be treated to an absolute taste sensation for lunch once it has recovered from the freshly baked treat enjoyed at morning tea! Your experienced long time local owner/skipper will take you for an unforgettable day of sailing in the Whitsunday Islands, allowing you to be as hands on with the actual sailing of the yacht as you chose, or just kick back and relax while enjoying the amazing views. Customised to suit you and of course Mother Nature, every experience is different yet as special as the next. As a small family owned business, the skipper with many years local knowledge can take you to those hidden gems only the locals know about. Another tick off that bucket list! The Full Day Gourmet Sailing Experience is an absolute must for those looking for a truly authentic personal experience with a passionate crew without all the crowds. Your gourmet palate will be treated to an absolute taste sensation for lunch once it has recovered from the freshly baked treat enjoyed at morning tea! Your experienced long time local owner/skipper will take you for an unforgettable day of sailing in the Whitsunday Islands, allowing you to be as hands on with the actual sailing of the yacht as you choose, or just kick back and relax while enjoying the amazing views. Customised to suit both you and your fellow guests and of course Mother Nature, every experience is different yet as special as the next.